Early in the settlement of South Australia, the climate was recognised as being suitable for almond production. Introduction of almonds to South Australia occurred on Kangaroo Island before formal proclamation of the state. By the early 1900's, commercial almond production was spread across the Adelaide Plains around the city of Adelaide. As Adelaide's urban areas expanded in the 1920's and 1930's, the almond industry became concentrated in the western suburbs (especially around the Marion, Edwardstown, Brighton areas), and developed in the Willunga and Southern Vales districts. Plantings subsequently expanded on the Northern Adelaide Plains (Virginia, Two Wells, Angle Vale) in the 1960's and 1970's, and then into the Riverland and Murray Valley areas. The SA Department of Agriculture has played a key role in fostering development of almond production in South Australia. George Quinn, the SA Department of Agriculture's first Horticulture Instructor identified the potential of this crop for South Australia's climate, and fostered early research on variety assessment, plant improvement, flowering and pruning. 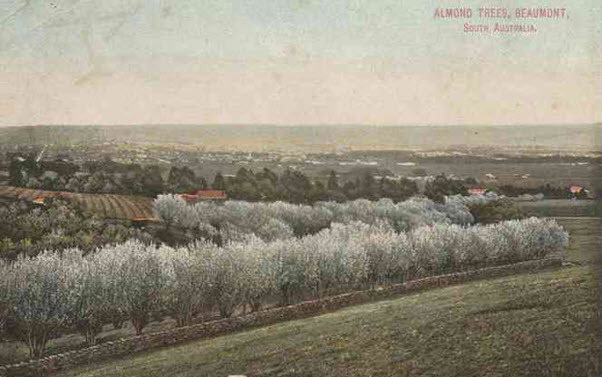 Almond trees at Beaumont, South Australia in 1910. Issued by the State Tourist Bureau and Intelligence Office. Source: State Library of South Australia B72520. 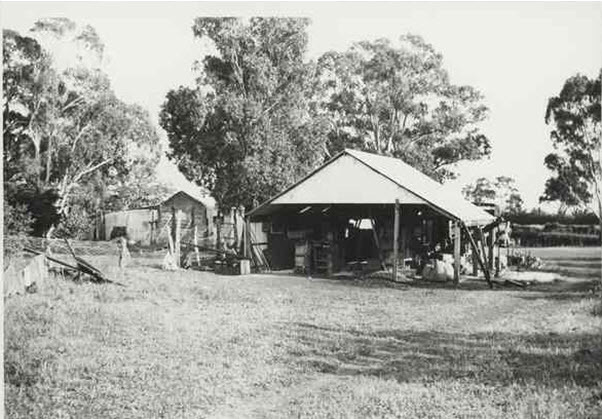 Almond and apricot stone cracking shed at "Watiparinga", Tonsley Park, ca 1932. Source: State Library of South Australia B33780. Almond cracking machine at Tonsley Park, ca 1932. Source: State Library of South Australia B33779. Almond sorting at Tonsley Park, ca 1932. Quinn, George; (1904) Some Notes on Almonds, SA Department of Agriculture Journal of Agriculture and Industry, No 6, Vol VII, P335. Quinn, George; (1928) The Almond in South Australia, SA Department of Agriculture Journal of Agriculture Nov 15 1928, P 328. In writing this publication, George Quinn, Chief Horticulture Instructor utilised latest research findings obtained from Hackney, Blackwood and Berri Research Stations. Quinn, Noel: (1941) Almond Culture in South Australia, SA Dept of Agriculture Bulletin No 367. Written by Noel Quinn, District Horticultural Adviser in 1941, this publication was subsequently updated by members of the Horticulture Branch in 1953. Baker B.T., Gathercole F.J., and Cowley R.W.I., (1973) Commercial Almond Growing, SA Department of Agriculture Extension Bulletin No 10.73. Baker B.T. and Gathercole .F.J. (1977), Commercial Almond growing, SA Department of Agriculture Bulleting No 9/77. This edition was also updated and reprinted in 1983, introducing new information about mechanical harvesting. The Almond Board of Australia published a comprehensive book about the history of the Australian almond industry in October 2012. This can be purchased on line from the Almond Board of Australia web site at www.australianalmonds.com.au/display/shopping/NEW/history , or by contacting Ms Jo Ireland, Communications Manager at the Almond Board of Australia on 08 8582 2055. This 336 page book written by Jennifer Wilkinson is titled "Almonds in Australia – From pioneer planting to prime production". It costs $35 and provides information about development of the almond industry over 100 years, and the role of growers, processors, marketers, nurserymen and researchers in development of the industry. This comprehensive book chronicles the endeavours of those that have shaped today's vibrant almond industry. It covers the history of almond production in Australia from the first plantings through to and including 1995 when the first national industry body was formed, the Australian Almond Growers Association. Jennifer Wilkinson is the editor of the Australian Nut Industries journal "Australian Nutgrower", and has authored 6 related books including "Nut Growers Guide".